Here’s a nifty little piece that you may have …. but not use. It’s called a carriage lock. As the name implies, it’s used when you are packing your machine to keep the carriage secure. The different brands and models of machines have different styles … let’s take a look. How many times have you knit something that just didn’t fit? Have you ever had colors run or fade when you washed your sweater? A knitter recently asked about adding French Darts instead of horizontal bust darts for better fit. I wholeheartedly agreed that this style of dart is much more flattering when sewing. But I had never considered it for knitting. After “noodling” for a while, I realized why knitters don’t use French Darts. 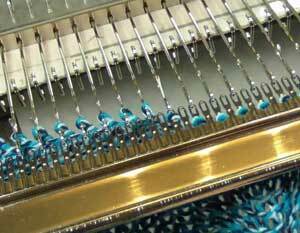 Tame that yarn tail when you are casting on or changing colors with your knitting machine. Put a little extra weight on the tail with a clothespin or clip of some sort. Not only will the initial cast on row be neater, the first few stitches of the next few rows will form properly, making seaming easier. Sometimes you just want a little texture to your knitting. When making the fabric for my baby shoes, I used an iron-on interfacing to firm up the fabric version. For the knitted version, I wanted a stitch pattern that was more “shoe-like”. I immediately thought of tuck. As it turned out, the shoes are so tiny, and my yarn was pretty thick, so I didn’t need tuck, but it took me down a path looking at different variations on the humble 1×1 tuck. I love 1×1 tuck because it can be worked on any machine, no programming necessary! Have you noticed that many of the knitted shawl/poncho patterns that we see in the magazines are just a plain ‘ol rectangle? The designer chose a fabulous fabric or yarn with an interesting stitch pattern. The New Knit it Now Blog! With our new blog format, we’ll have tools that will allow us to offer more information for your machine knitting journey. Designed to display on any device, easily scroll through images, read the posts and locate previous topics.Don’t miss any news, tips and inspiration! Inspired by cloth baby shoes, this knitted version is too cute! All you need are a couple of small swatches (or re-cycle a UFO in your stash), a small bit of fabric (a fat quarter is more than enough. Add a little elastic, cut ‘n sew ….and you’ll have an adorable knitted baby gift in no time! 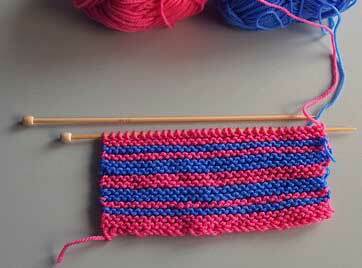 Garter Stitch: In hand knitting, knit every row. 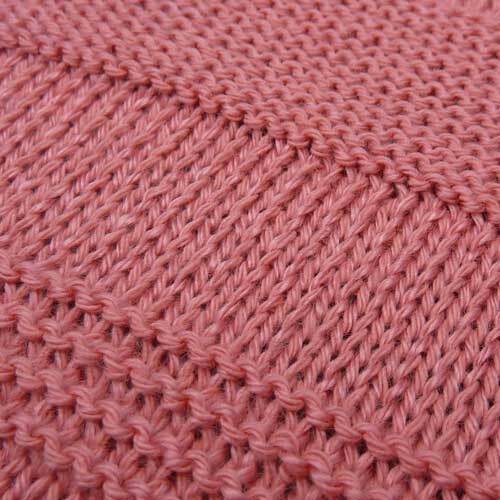 One of the first surprises for most machine knitters is the fact that the humble garter stitch is problematic on the knitting machine. Because our needles face in one direction and they form uniform stitches in one direction, we can easily produce stockinette stitch (translated knit 1 row, purl 1 row) but to knit every row?….. Here are 8 ways to create garter stitches for machine knitters. The simplest way to get the bumpy appearance of garter stitch is to use the purl side of your knitting as the public (right) side. 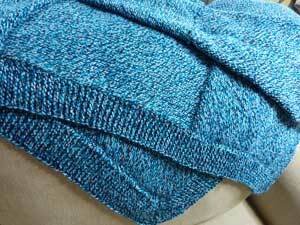 machine knit blanket has reverse stockinette blocks and hand knit garter stitch bands. 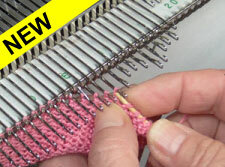 Master using a garter bar to “RTR” (remove- turn – rehang) a large numbers of stitches to add garter rows to your knitting. This isn’t practical for an entire garment, but is useful in adding stripes of garter stitch or knitting bands. 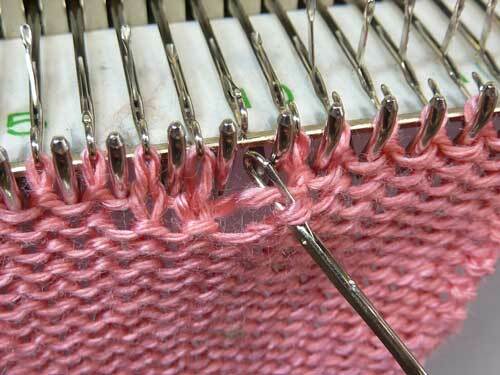 A variation on RTR (Remove-Turn-Rehang) is to use a hand knitting needle. Remove each stitch of a row, turn the work and rehang each stitch. 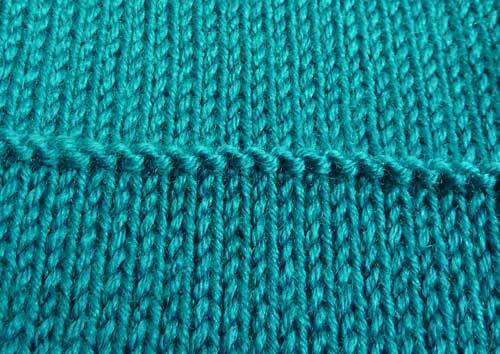 Knit a row … then repeat … and repeat … and repeat for garter stitch. Brother Machines offered an optional accessory called a Garter Carriage. This is a motorized attachment that has a single latched needle that faces the opposite direction from the needlebed of the machine. 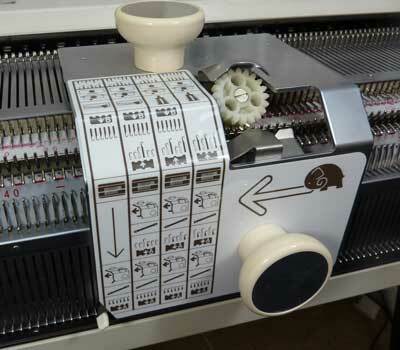 Utilizing the motor, the G-carriage automatically reforms each stitch (one at a time). Needless to say this is a slow process, although it can run almost unattended. It is great not only for garter stitch, but for knit and purl stitch patterns as well. 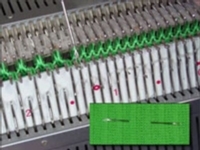 Hand manipulation – The most tedious method is to reform each stitch. Use your latch tool and pick up a single stitch in the row below the current row. Remove the stitch from the machine, unknitting the current stitch. Using the latch tool, re-form the stitch and re-hang it on the needle. Although tedious, this method can be used for small amounts of accent stitches. Although a ribber has needles facing in the opposite direction than the main bed, knitting garter stitch still requires hand manipulation with a ribber. For example, cast on your main bed and knit a few rows. Raise (engage) your ribber and transfer all the stitches to the rib bed. Knit a row. Transfer all the stitches back to the main bed and knit a row. Repeat for garter stitch. Another accessory is a transfer carriage. 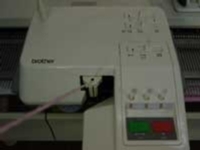 It “automatically” transfers stitches between the needlebeds. There is NO law that says your entire project has to be done on the knitting machine. There is also NO law that says all knitting must be done by hand …. (machine knitting is NOT cheating). Considering all the time and fuss it takes to create garter stitch on the machine (except for the g-carriage)… if you want garter stitch hems, hand knit them, then hang the work back on the machine to finish. If you want a stripe of garter stitch, remove the work from the machine on a hand knitting needles, hand knit the stripe and hang it back on the machine.